The Black Dog Coffee Company was born out of a decade’s long journey in search of the ultimate cup of coffee. Our efforts led to an astonishing discovery. The secret to great coffee isn’t in a big brand name, fancy labels or the word “gourmet.” The secret is in the bean. It turns out that most of the coffee beans we found on grocery store shelves and even in many popular coffee shops were an inferior grade, over-roasted beans that had gone stale long before they even reached the shelves. Learning this, we began to procure only the best lots of Specialty Grade green coffees from around the world and roasted small batches with fanatic care in our home. The difference was phenomenal. We discovered flavors and nuances we didn’t even know coffee could have. We realized how much impact degree of roast and freshness have on our favorite beverage and were excited to savor the variety of essence that different single origin coffees bring to our table. 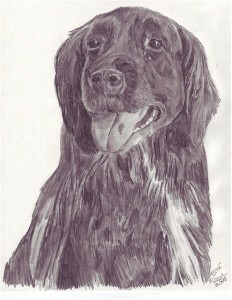 Bear, the beloved and famous Black Dog of Black Dog Coffee, was born on Jan 1, 1999. and passed away peacefully on July 8, 2012. Bear was not only the spirit and inspiration of The Black Dog Coffee Company, he was my best friend and near-constant companion. Many of you got to meet him and even for those that didn’t, you should know that he helped to roast every cup of Black Dog Coffee during his tenure. Despite his executive status, he appointed himself the job of being present for all aspects of the operation, from roasting to bagging and shipping. Despite the fact that in the early days we roasted essentially outside, he never missed a day of work and was beside me no matter if it was blistering hot or bitter cold and wet. Bear’s example of unconditional love for all living things and his dedication to his ‘job’ were truly an inspiration for me.Even though he is gone I know his spirit is here to guide us and his memory will live on in the business that he inspired. Rest easy, Bear. I love you. Java, the new coffee dog, came to us from Friends Fur Life Rescue of Berkeley County WV almost exactly a year after Bear’s passing. 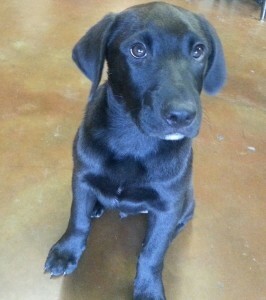 He stole our hearts right away and stepped effortlessly into the role of company Spokesdog. Like Bear, he’s at work every day and is learning the trade quickly. Many have commented that he has big shoes to fill. We tell them, that’s OK. he has big feet. Special thanks to our good friends at Tri-State Pet Care for introducing us to Java and helping with the adoption process. 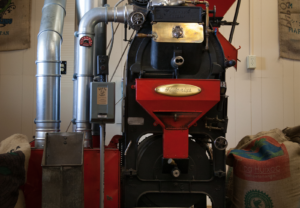 Plutonius is among a small handful of the oldest operating roasters in this country and one of only four Jabez Burns Model 7R machines that we have been able to find still in use. She began her life in New York City on March 2nd, 1931 where she was designed and built by Jabez Burns & Sons at their factory on the corner of 11th Ave and 42nd St. Her first home was with Fred Wolferman at Wolferman’s Grocery in Kansas City, MO. 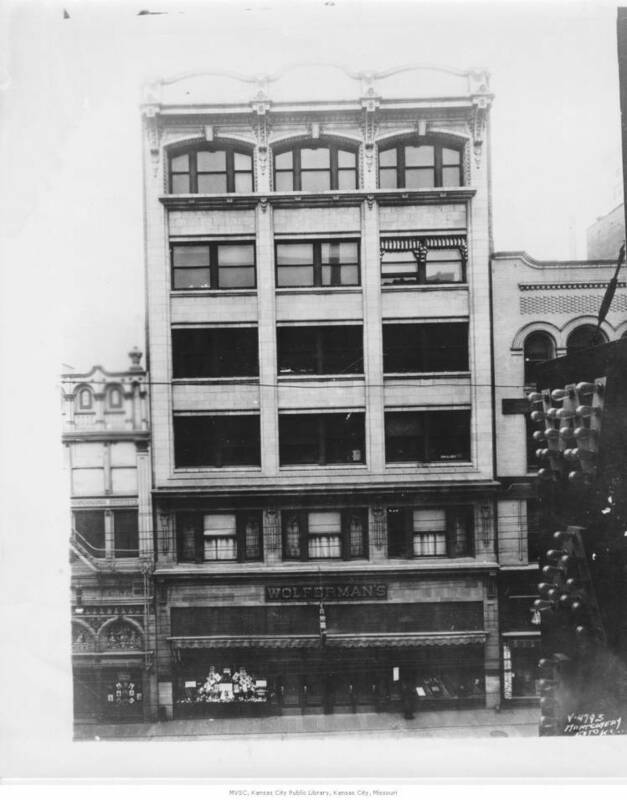 Wolferman’s was the premier grocer in the Kansas City area. They did baking (including their famous English Muffins), candy making and with the addition of Plutonius, coffee roasting. Our research shows that Plutonius lived at Wolferman’s at least into the late 40’s and very likely much later. There is some indication that she may have done a stint at Gaslight Square in St. Louis in the early 70’s, but we have been unable to confirm that. We do know that she made her way to Alexandria, VA by the late 70’s and was in use there when she was acquired by Carol Simmons of The Coffee Bean. In 1986, The Coffee Bean moved from Alexandria to Leesburg, VA and settled into a cozy shop on King Street. It just so happens that our founder and Roast Master, Brian Bircher, lived in the apartment above the shop at the time. Although not roasting coffee yet, he attributes this chance encounter as to when he caught the roasting bug. Years later that would lead to the creation of The Black Dog Coffee Company. First location of Plutonius was with Fred Wolferman at Wolferman’s Grocery in Kansas City, MO. The Coffee Bean thrived and Carol and crew, including Juanita Frye and roaster, Ed Sowa provided Leesburg with fine fresh roasted coffee from Plutonius. In 2010, Carol retired from the coffee business and closed the shop. The Black Dog Coffee Company acquired Plutonius in December 2011, and she began production in our new roastery in Shenandoah Junction, WV, in July 2012. Jabez Burns is legendary himself in the coffee roasting industry and is known as the Grandfather of modern coffee roasting. He began his business in the late 1800’s designing and manufacturing coffee roasting equipment. His designs brought control and efficiency to what had previously been a rather crude and unpredictable, though in-demand trade. Fuel efficiency, temperature regulation, airflow control, integrated cooling and de-stoning now allowed the coffee roasting process to evolve from trade to art and enabled roasters to create profiles tailored to the particular coffees, coaxing the finest flavors from them. You do not give to pepper or ginger or cinnamon or cloves strength or quality, pungency or aroma — but Coffee you develop and by skill and judgment change from caterpillar to butterfly. You bring out hidden treasure. It is a tribute to Jabez Burns that not only do some of his own creations, like Plutonius, continue to live on, but most modern roasters manufactured today are based on his designs.